MM's Kitchen Bites: Saffron rice...kuch peela ho jaye!! Wash the rice till water runs clear. Soak for half an hour in enough water to cover the rice. Drain the water from the rice and keep aside. Soak the saffron strands in 2-3 tbsp of warm water. Put water/stock to boil in a pan. In a separate heavy bottomed pan, add ghee/melt butter over low heat and add all the whole spices. After about 30 seconds, add in the onions, salt and sugar. Cook the onions till they go soft a pale golden colour. Add in the rice and fry, stirring constantly but gently, till the ghee coats the rice and rice turn translucent. Add in the boiling water and saffron infused water. Check for salt and let the water return to boil. Reduce heat to low, cover, and simmer until all liquid is absorbed, about 12-15 minutes. Remove from heat. 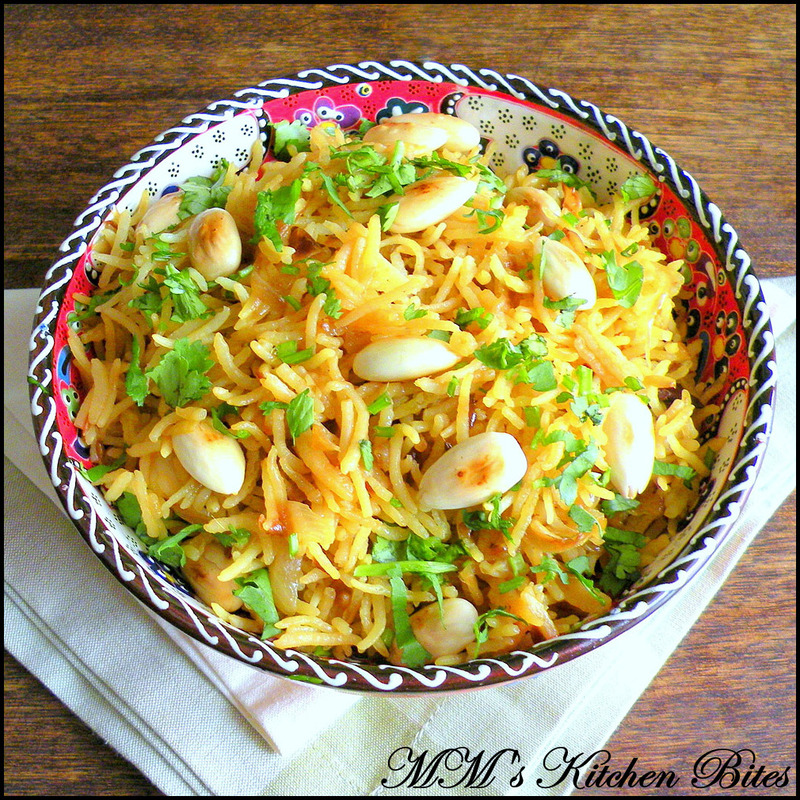 Remove the lid, and sprinkle half of the cashews/almonds over the rice but do not mix in. Place lid loosely over the pot and let stand for a further 10-15 minutes. 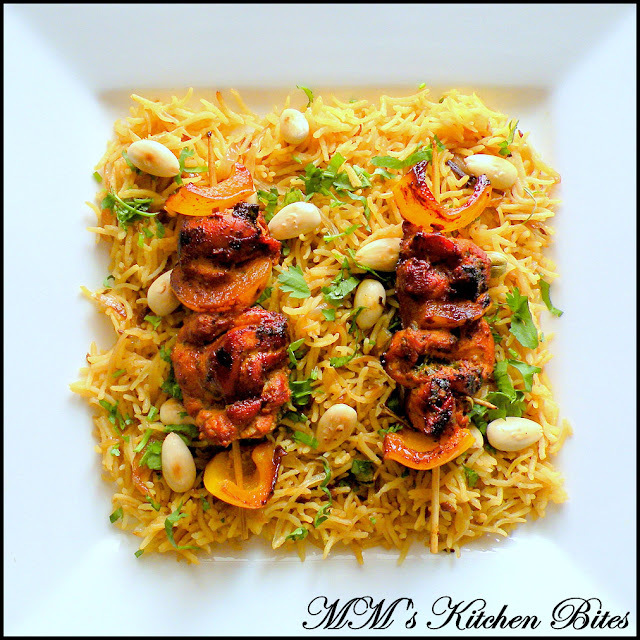 Fluff rice with a fork and serve sprinkled with balance cashews/almonds and parsley. Ideally use flaked almonds. I don’t like almonds and I find it easier to pick out whole almonds and pass them on to hubz. Sugar with onions helps with caramelizing, but you can skip it if there are dietary restrictions. If you can’t find flat leaf parsley, skip it but please don’t add coriander. If you don’t have saffron, you can add ¼ tsp turmeric.